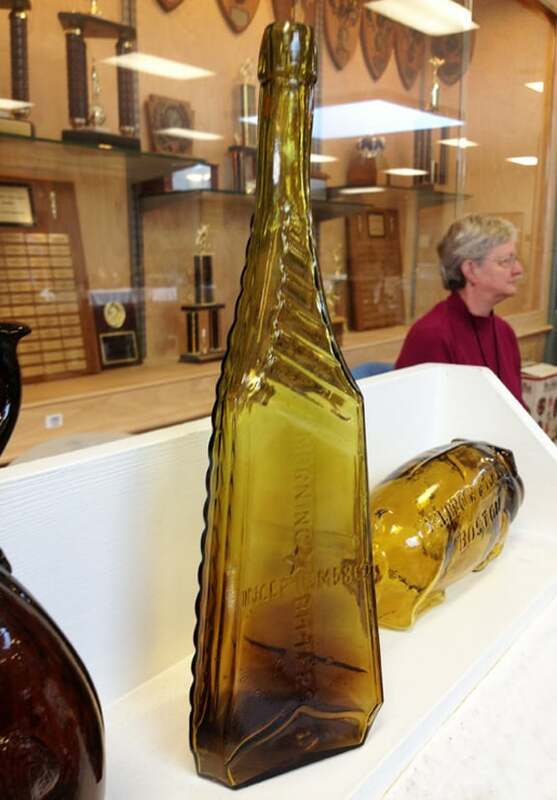 I was looking closer at Ed and Kathy Gray’s (GreatAntiqueBottles.com) Morning Star Bitters (see above) yesterday at the Yankee Bottle Show in Keene, New Hampshire. 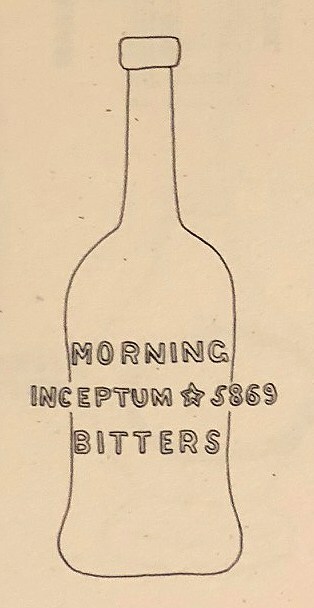 This is quite an extraordinary and exciting example with the triangular form, 18 diagonal ribs, olive toned color and raised typography reading “Morning (motif star) Bitters, Inceptum 5869 and Patented 5869”. It is also from Baltimore which makes it even more fun, being I am a native Baltimorean. 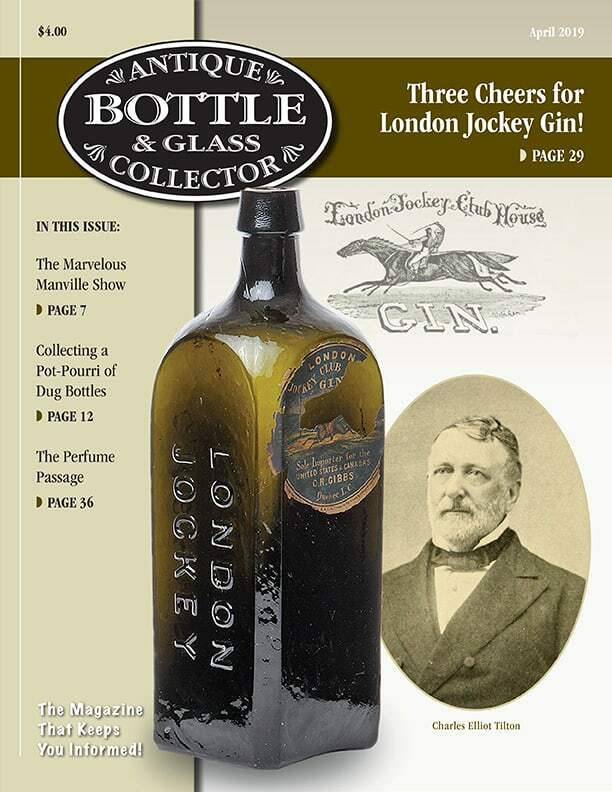 The sticker price on the Great Antique Bottles web site is $6.700 though I believe the Gray’s might sell the bottle for $5,800 or so. 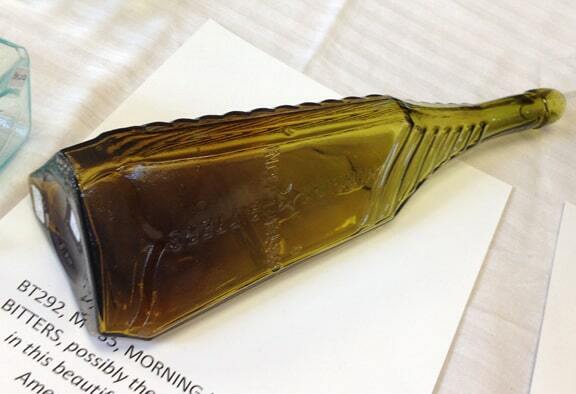 A big ticket price for a usually low-priced bottle when you find it in amber. It’s all about color, character and condition. The three C’s. While reading the description above on their table, I saw the note “possibly the only known example in this beautiful greenish coloration”. 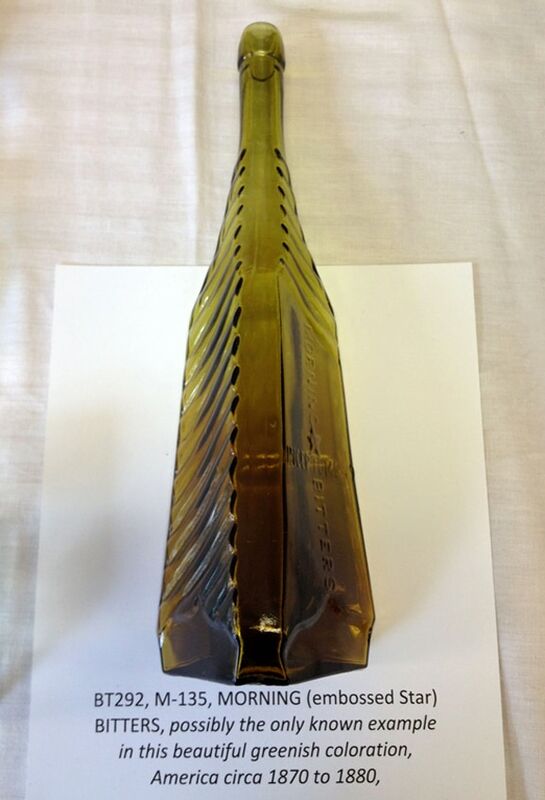 I am reminded of a very similar example of a Morning Star Bitters in my collection. I have posted those pictures further below. Which example has more green? It is really hard to tell unless you have both together. They are both great examples. 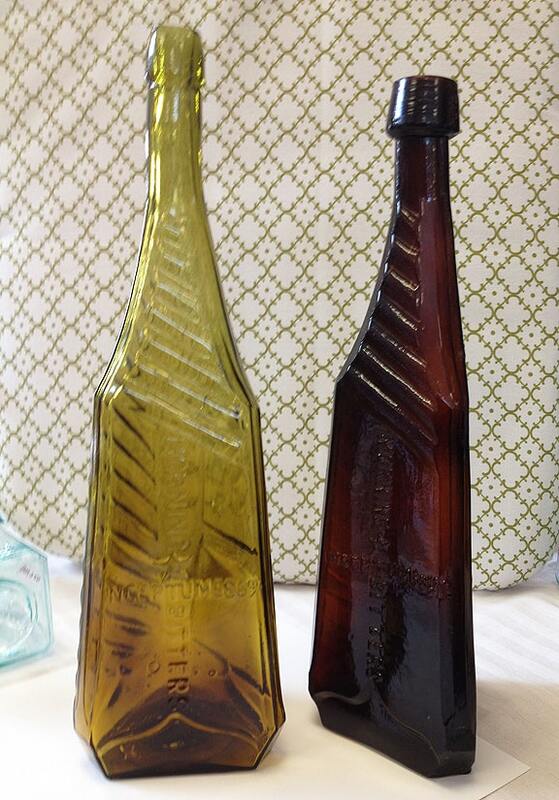 It is also fun to compare the olive toned bottle to an amber example. 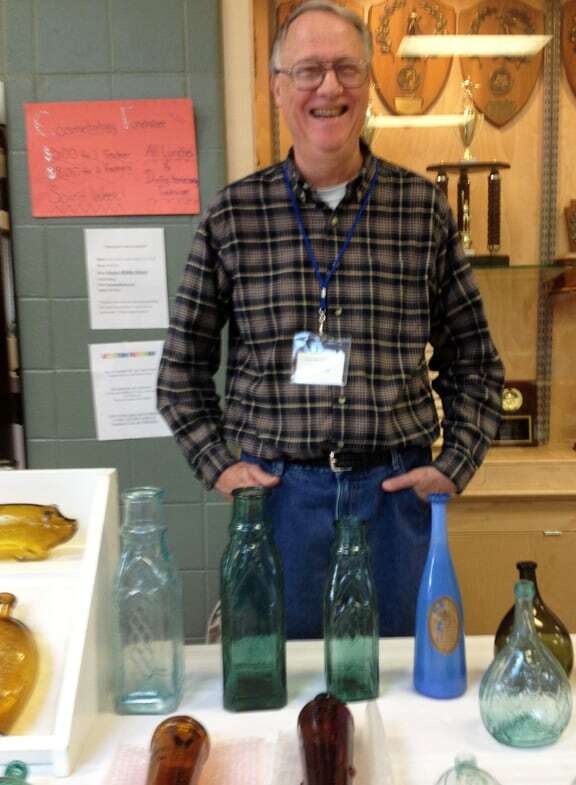 One was at the Keene show (on Jim Mitchell’s table). I borrowed it and photographed it with the Gray example (see below). Look at the crazy applied mouth! 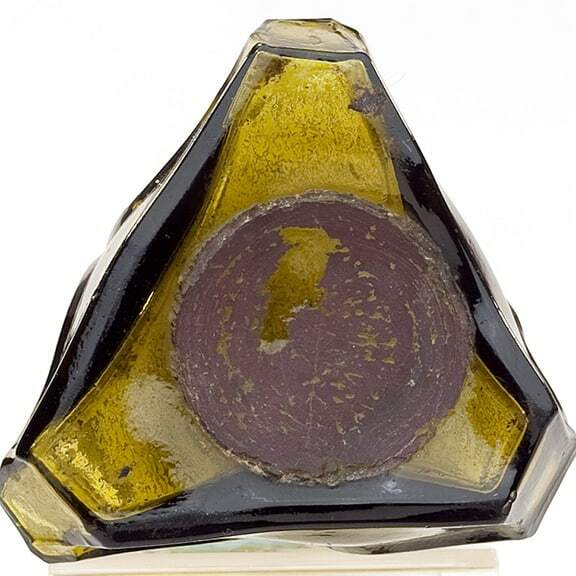 An amber example from my collection is also posted below. Morning Star Bitters Company Charles Street Baltimore, Md. 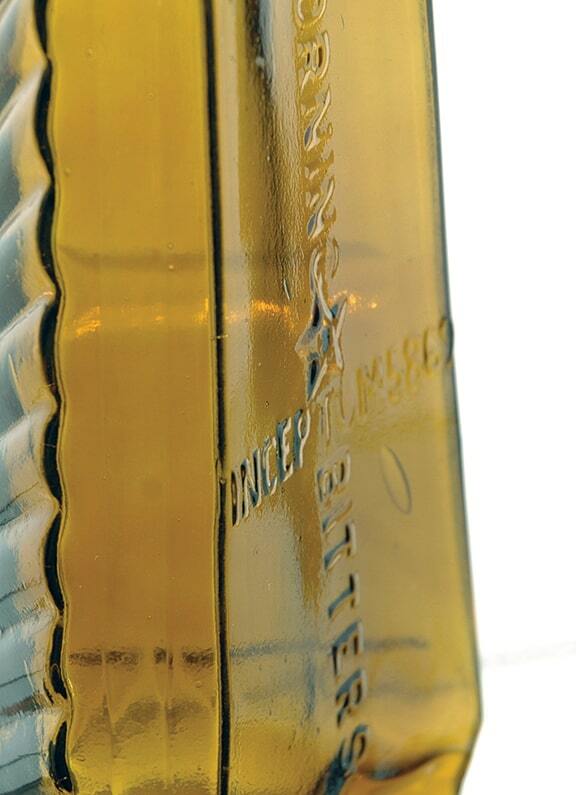 The first proprietor of Morning Star Bitters was John Burns located at 100 South Charles Street in Baltimore, Maryland in 1866. He created a company called Morning Star Bitters Company to market and sell his product locally and across the state line in West Virginia. 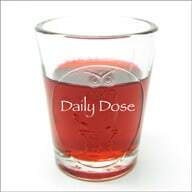 He said it was the Greatest Tonic of the Ages. By 1868, it was Burns & Weigley (John B. Burns and O.C. 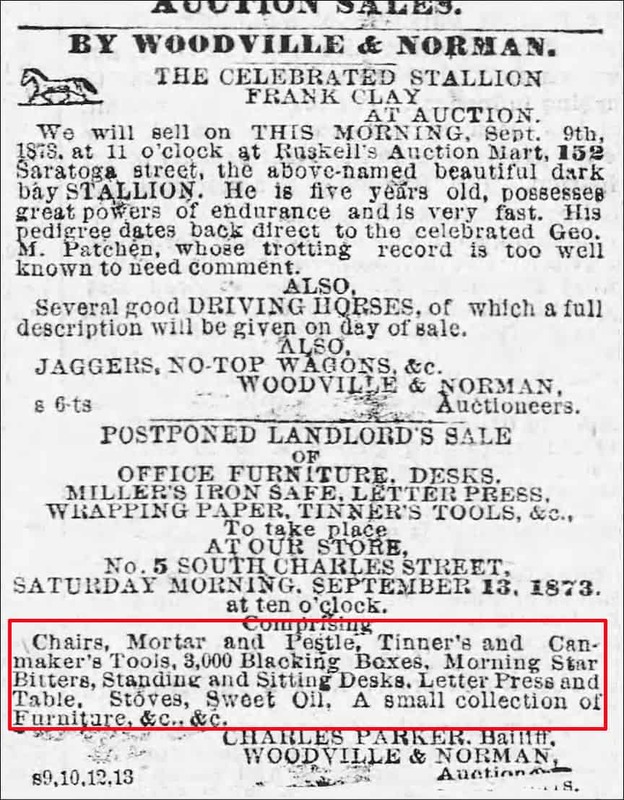 Weigley) who were selling Morning Star Bitters at the same address, same company. 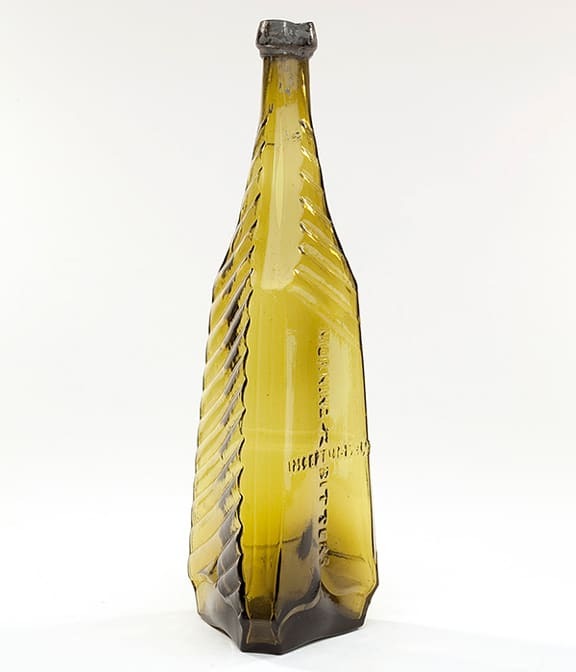 They would patent the brand and signature bottle in 1869 though the first bottle was not the triangular form we are familiar with. 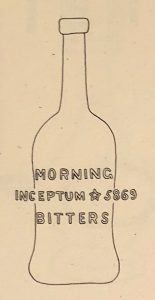 Apparently there is a round bell form bottle in aqua embossed “Morning Inceptum (motif star) 5869 Bitters” that is 10 3/4″ tall. Ring & Ham list it as M 134. An illustration is below. 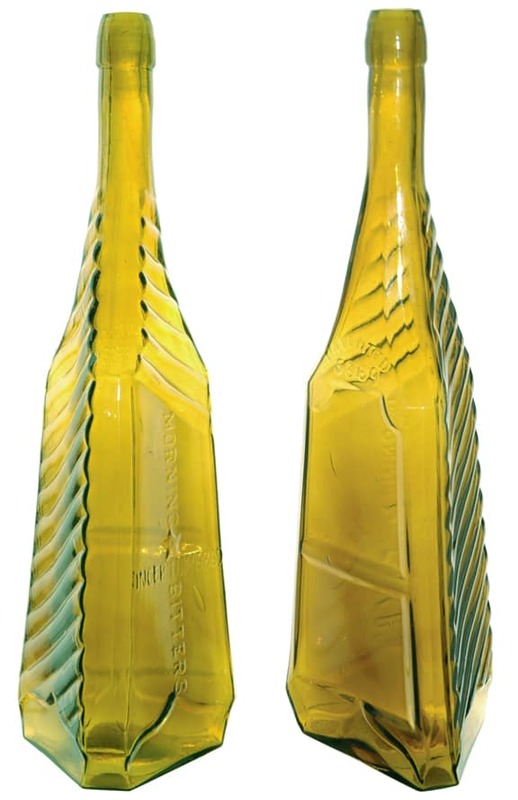 By 1869 or 1870, the first pontiled triangular bottles were produced. This is just conjecture, but on the evening of March 17, 1868, Grand Chancellor William P. Westwood, assisted by Past Chancellor John Shulz, of the District of Columbia, and Past Chancellors Charles E. Lowe, James A. Campbell, N. M. Bowen, C. F. Abbott, William H. Tindle, and Samuel DeHaven, of Maryland, opened the proceedings of the Knights of Pythias held at Druid Hall at the corner of Baltimore and Gay Streets. O.C. Weigley and John Burns were also members. 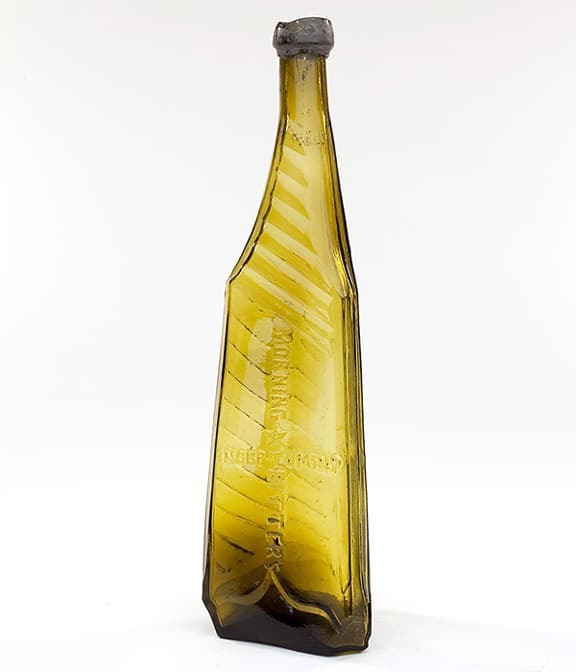 Could it be that Cornelius F. Abbott was first introduced to Morning Star Bitters as he would later take over the brand in 1873? 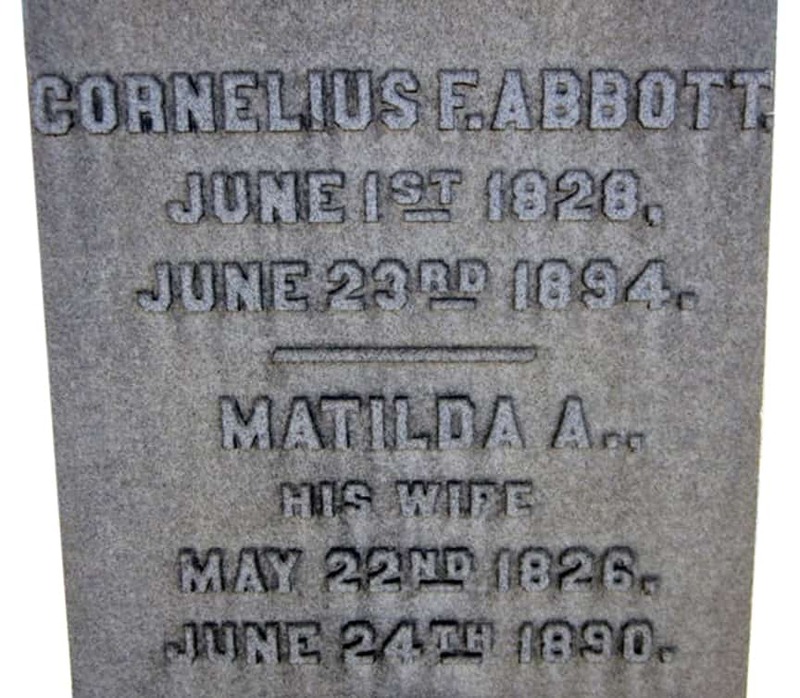 Cornelius Frederick Abbott was born on June 1st 1828 in Cambridge, Massachusetts. He was the son of Joseph Abbott and Electa Abbott. 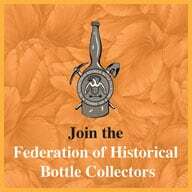 We next find him listed in Baltimore, Maryland in 1860 as stave maker, staves being the narrow strips of wood or narrow iron plates placed edge to edge to form the sides, covering, or lining of a vessel (such as a barrel) or structure. 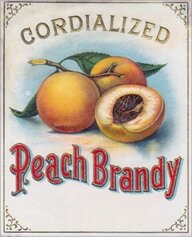 In 1865, Cornelius F. Abbott & Co. is listed as a wholesale liquor dealer in Baltimore. In the following years Abbott is also listed as a tobacconist and an insurance agent. 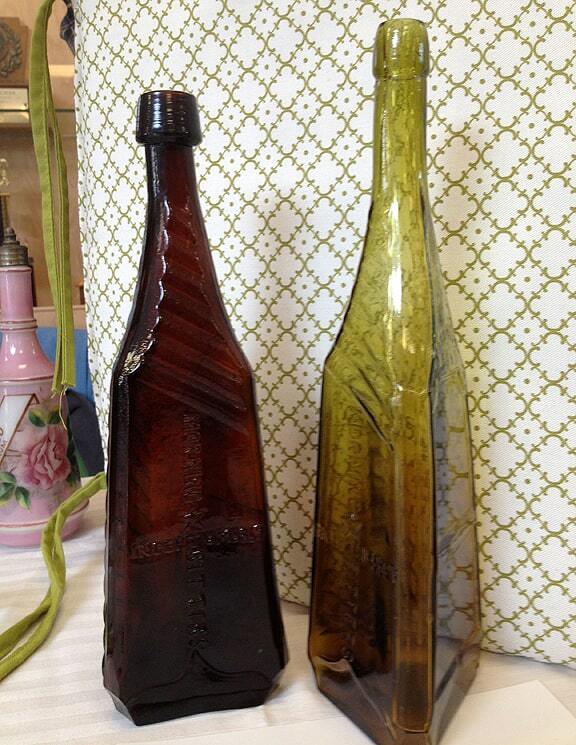 In 1873, we first see Abbott’s name with Morning Star Bitters at 210 Conway Street and then 85 Camden in 1874. 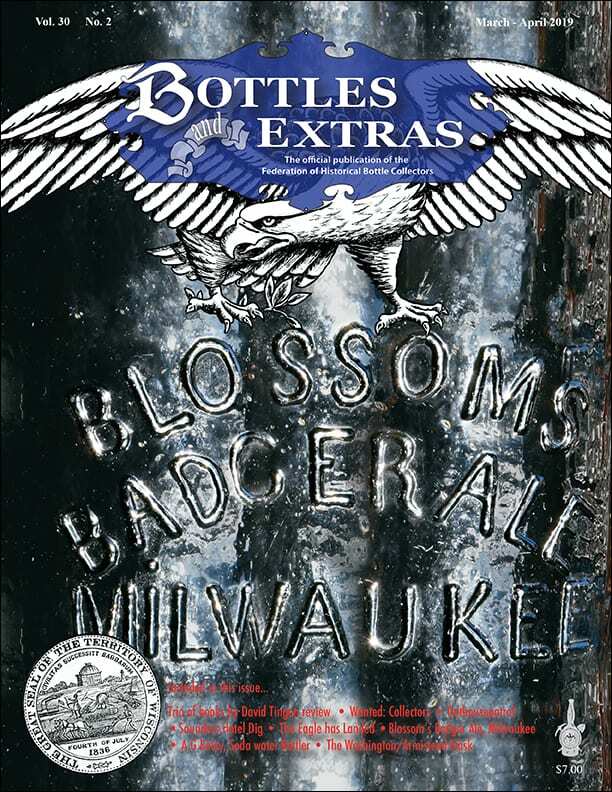 In 1878, his son Cornelius Webster Abbott joins the company and they both run their business and Morning Star Bitters Company. They were located at 110 S. Charles Street and German Street where they also had their chemical laboratory. 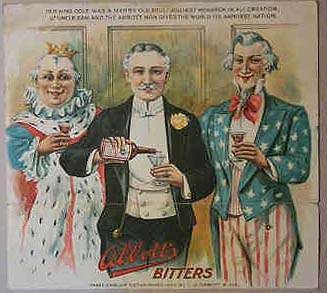 By 1880 or so, the son would pretty much take over and the business name was changed to C. W. Abbott & Company. They continued to be addressed at Nos. 110 and 112 South Charles Street. 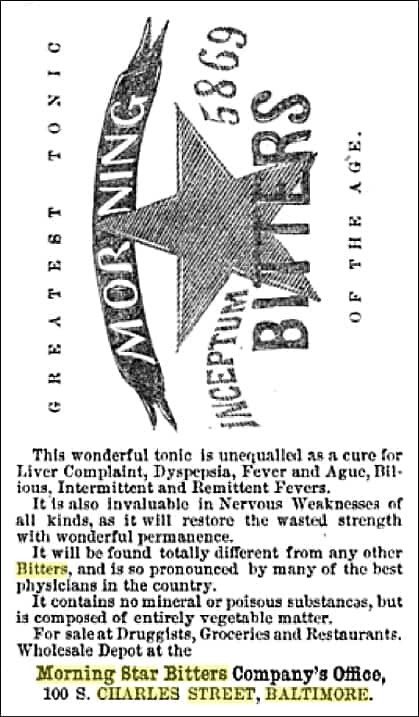 At this location was the extensive laboratory of C. W. Abbott & Co. who by then were the manufacturers of and wholesale dealers of the famous Angostura Aromatic Bitters, Morning Star Bitters, Wine Tonic, Essence of Peppermint, Jamaica Ginger, Flavoring Extracts, Fruit Syrups, etc. 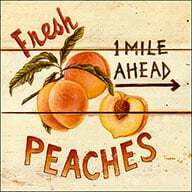 Advertising stated that these goods were all “manufactured from the finest ingredients, and by competent men, thoroughly skilled in their use. Their merits are too well understood by the trade and the public generally to require comment in this work, which fact is demonstrated by their large sale in all parts of the country.” Abbott also manufactured Abbott’s Prepared Medicated Oyster Shell Remedy which was a very valuable article for fowls. 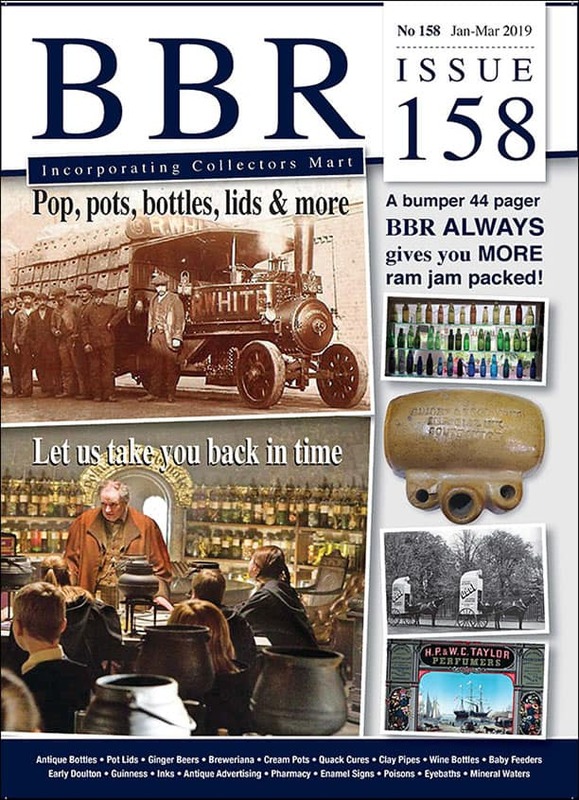 The building used for the manufacture and sale of these goods was three stories in height, 40 x 80 feet in dimensions, and a large number of hands were employed. Abbott products would continue to be sold for many years thereafter. C.F. Abbott would die on Saturday morning, June 23, 1894 at 11 o’clock in the 66th year of his age. His obituary said he was a Mason, a member of the Eureka Lodge of the Royal Arcanum and a member of Franklin Square Baptist Church. C.W. Abbott would live a long life, carry the torch and die in 1932. 1855: Cornelius Webster Abbott (son) born 30 December 1855 in Baltimore City, Maryland. 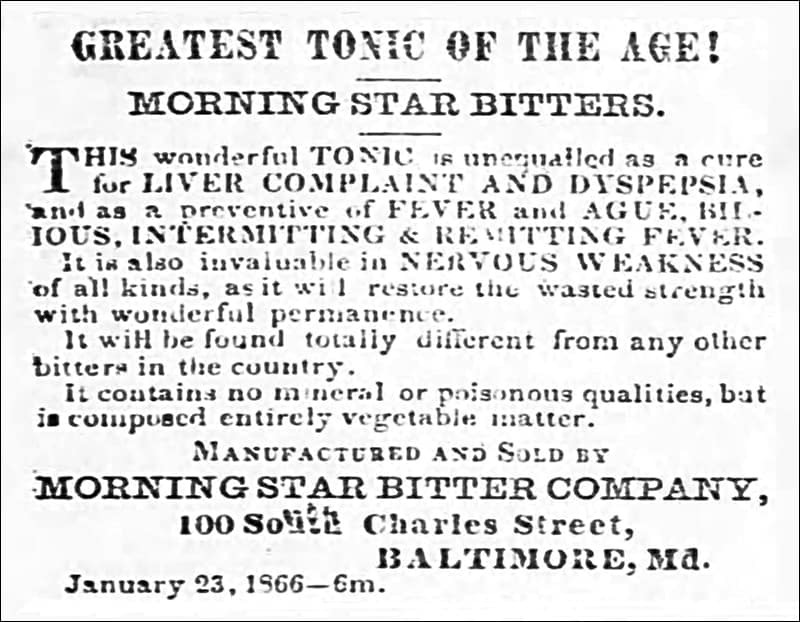 1867: Advertisement (below): Morning Star Bitters Company, 100 S. Charles Street, Baltimore from The Rural Gentleman: a monthly journal devoted to horticulture. 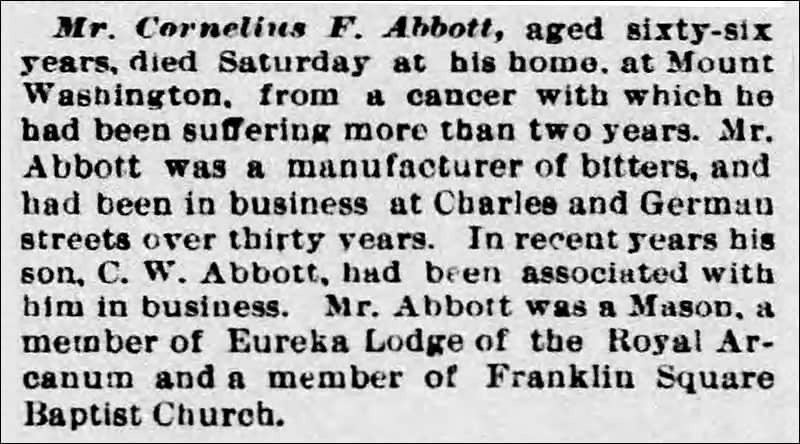 1894: Obituary: The Baltimore Sun June 25, 1894, On Saturday morning, June 23, at 11 o’clock, Cornelius F. Abbott, in the 66th year of his age. Funeral will take place from his late residence, Mount Washington, this Monday morning, June 25, at 8:30 o’clock. Train leaves Calvert station at 9 A.M.
1932: Obituary: The Baltimore Sun, January 11, 1932. Funeral services for Cornelius Webster Abbott, who died Saturday night after an illness of several months, will be held at 11 A.M. tomorrow at the home of a son, John M. Abbott, 5506 Lombard Place. The Rev. Dr. S. Targat Steele, rector of St. James Protestant Episcopal Church, will conduct the services. Burial will be in Loudon Park Cemetery. 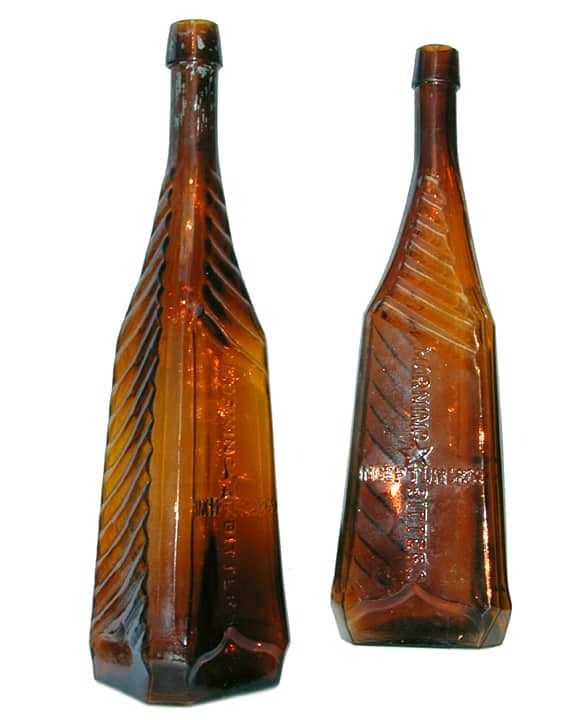 Mr. Abbott who lived at the Roland Park apartments, was the founder and president of the C. W. Abbott & Co., bitters manufacturers. He was born in Baltimore in 1855 and was the son of Cornelius Frederick Abbott, of Boston and Matilda Price, a native of Queen Anne’s county. Besides John M. Abbott, his widow, Mrs. Ida Mengel Abbott, a daughter, Mrs. Daniel Summers and two other sons, C. Webster and C. Frederick Abbott, survive. 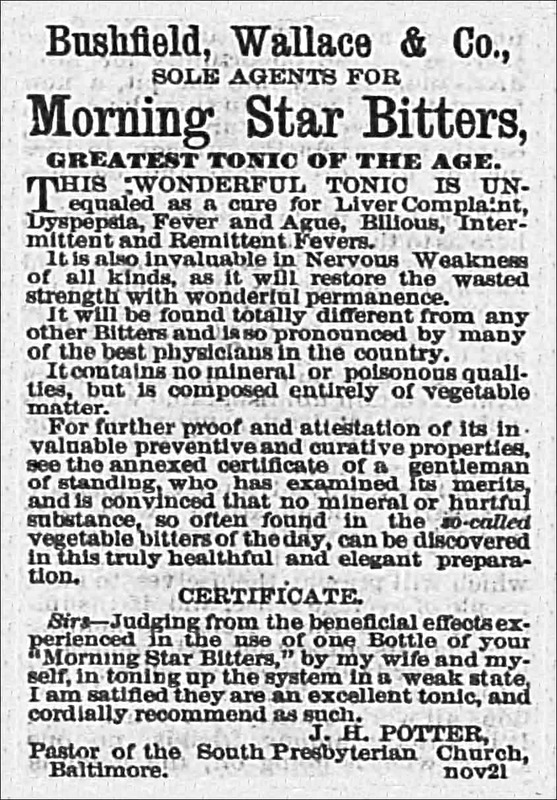 This entry was posted in Advertising, Bitters, Bottle Shows, Collectors & Collections, History, Liquor Merchant, Medicines & Cures, Tonics and tagged Baltimore, bitters, Bottle, Burns & Weigley, Charles, Cornelius F. Abbott, Cornelius W. Abbott, Ed Gray, Inceptum, Kathy Gray, maryland, Morning Star, show, stave, Street, Yankee. Bookmark the permalink. 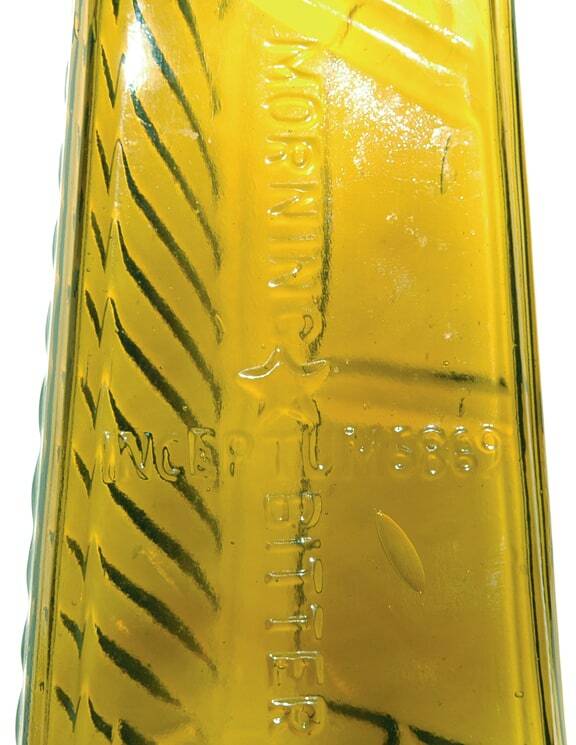 i have the same exact morning star bitters bottle as shown above. i am interested in selling it..where can i go to sell it? sorry, i am new to this. What color is it? Condition? 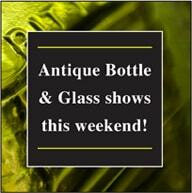 Please send pics to email address noted on home page. it is exactly like the bitter bottle you show. 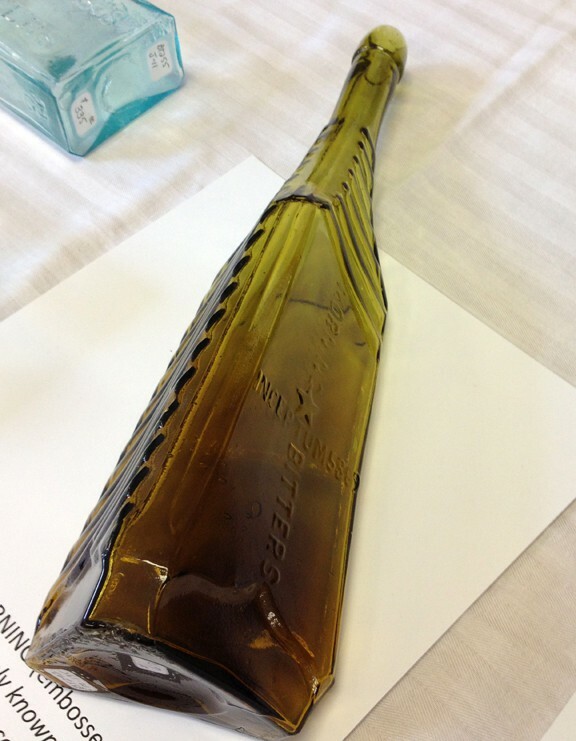 the color is olive green in great condition and still has the metal on the lip and pontil.